It is difficult to get a good picture of the Scrappy Trapunto quilt, but here it is. 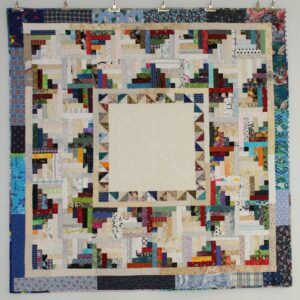 The quilt top was 57 1/2″ square, but with the trapunto, machine quilting and washing it ended at 54″ square. It surprised me a bit with how much shrinkage there was, but that is something to remember for future quilts. I like the soft look of the trapunto and will use this technique in other quilts. How about some trapunto bats and ghosts on the Happy Halloween quilt? 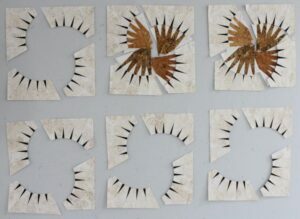 This is my design wall – the Rocky Mountain Bear Claw by Judy Niemeyer. I started this project the beginning of June and got the claw parts of the block finished. Now it is time to get busy and sew the bear paws. The pattern shows a table runner of 4 blocks and 2 pillows, but my plan is to make a quilt top. I still haven’t made a firm decision on the layout. 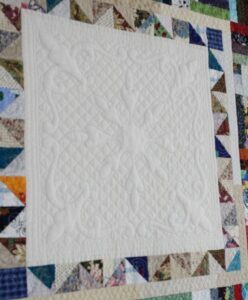 Let’s be honest – 6 blocks is a strange number to set into a quilt unless you want a long skinny quilt which I don’t. I have several ideas, but I will be able to make a better decision once I can play on the design wall. Good job on the trapunto. That bear claw is very interesting. Can’t wait to see what you do with it.